Well, I have waited for a while now to post on Microsoft's new cloud computing platform because I was waiting for something, well, of substance. 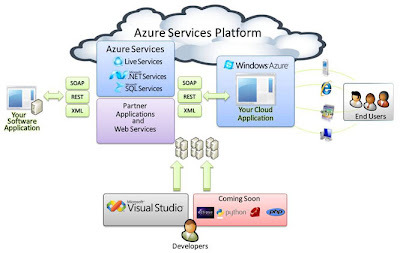 Does anyone else but me find it humourous that they have named their cloud computing effort Azure? Makes me think of a cloudless day ironically. I have said in the past that Microsoft is late to the game, and it looks like they are going to be even later. Seems as if everything that they have to offer is still in preview mode and I have seen very few examples of working applications on the Live Services or Azure platform. I do have the need to run some applications on Windows technology right now, and I was looking forward to Microsofts entry into cloud computing to see what I might be able to make use of, but with Amazon now offering Windows 2003 servers as AMIs I am wondering if the Azure platform will even be necessary. Will Microsoft be able to compete with Amazon on price? I think I will wait and see what the price model will be and how much they really intend to support the "Coming Soon" application languages and platforms such as Eclipse and PHP. If the only parallel you can draw to Azure is Amazon's hosting of Server 2003, then I'd suggest you really don't understand Azure. Spend a little more time taking a look at the capabilities of Windows Azure, the .NET Developer Services, and SQL Data Services - very different from the Amazon offerings. P.S. I have to admit that I too find the naming a bit humorous. Wade, thank you for the comment and for the suggestions. I certainly can see other parallels and I am not saying that a Windows 2003 AMI is equal to all of what Microsoft has to offer with Azure. I do wish that their tools did not require the Windows platform on the development side. It would be much simpler for those of us on Linux and Mac OSX to try it out without having to run VMWare or Parallels all of the time. I understand the need the the Microsoft Cloud to run on that platform server side, but all the tools seem to be locked to Windows as well. At any rate, I have spent some time with the services, although I have to say in all fairness that I have done more development on AWS and Google's AppEngine platform. I am not convinced that Microsoft has made it easy enough yet. Thanks for the post again. If you have something you would like for me to take a look at specifically, I would welcome the opportunity. I will continue to dabble!